Founded: 2004 (Spun-off from Motorola's Semiconductor Division), Acquired by NXP Semiconductor in 2015. Specialty: Was one of the largest designer & manufacturer of embedded semiconductors for the automotive, consumer, industrial, networking and wireless markets. 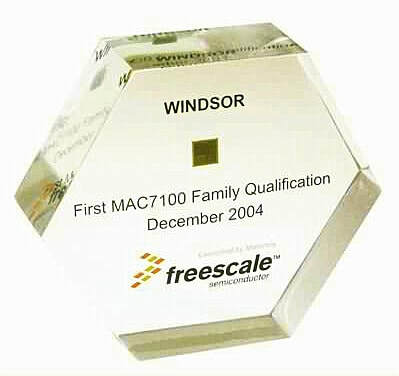 Lucite paperweight from Freescale Semiconductor that features an actual "Windsor" chip embedded inside. Windsor was the first of Freescale's MAC7100 family of automotive microcontroller (MCU) chips. Freescale Semiconductor worked with ARM Technology to develop the MAC7100 chips, which were based on ARM's ARM7TDMI microprocessor architecture. The MAC7100 family of chips were 32-bit Flash memory based devices developed specifically for embedded automotive applications. Automotive applications for the MAC7100 MCU chip included airbags, climate control systems, and electric power assisted steering (EPAS).